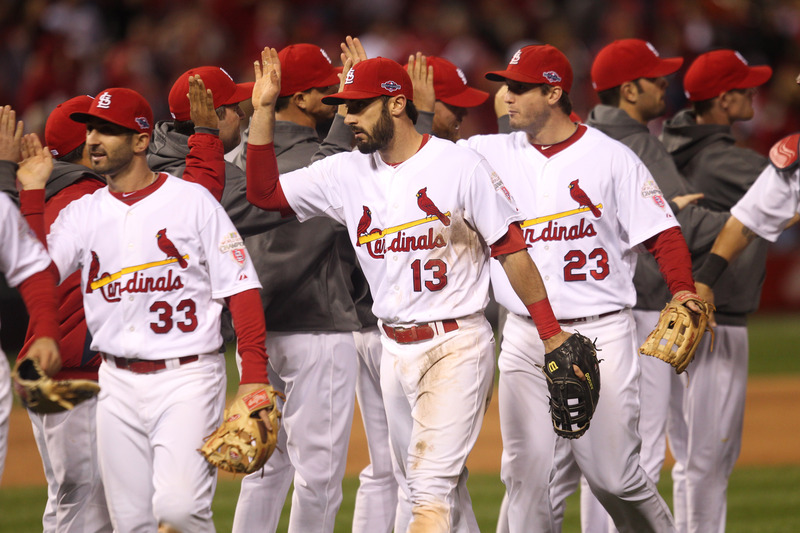 The Cardinals are one game away from returning to the World Series following their 8-3 win over the Giants in Game 4 in the NLCS on Thursday night at Busch Stadium. Adam Wainwright delivered a stellar performance, in a bounce back outing for the club’s ace, as he pitched seven innings allowing one run on four hits while striking out five. Wainwright’s lone mistake was a long solo homer to Hunter Pence in the second that cut the Cardinals lead to 2-1. Beyond that, more of the same from the Giants backs like we’ve seen most of this series. San Francisco went 1 for 5 with runners in scoring position and failed to string together hits when they had their chances. On the other side of the field, the Cardinals continued to deliver clutch hits, including their 3-4-5 hitters who combined for nearly as many hits in this game as they have the entire series. Matt Holliday, Allen Craig and Yadier Molina went a combined 5 for 12 with five RBIs. Entering this game, the trio had been quiet. The entire club pounded out 12 hits with Holliday, Molina and Jon Jay driving in two runs each. The Giants meanwhile picked up a late two run homer from Pablo Sandoval. He along with Buster Posey and Hunter Pence are a combined 7 for 45 this series. The Cardinals can clinch the NLCS tonight Friday night, with Game 5 set for 7 p.m. Lance Lynn will face Barry Zito.